Marvel Comics' Thors will tell stories of parallel universe Asgardians who close murder cases, are loose cannons, and don't play by the rules. Secret Wars is prompting Marvel Comics to dig all kinds of bizarre and fascinating concepts from the woodwork - including a merger with the Ultimate continuity, the resurrection of iconic universes, and the debut of an all-female Avengers. That's a lot to follow, but I think I just found my personal favorite: Thors, the story of a cosmic police force made up of parallel dimension versions of Thor. That's not a joke - that's literally what writer Jason Aaron hopes to achieve. "This is basically me doing a cop story, but with hammers instead of guns," Aaron said in an interview with Marvel. "This is me getting to do Homicide: Life on the Street with lots of cosmic cops. It's every version of Thor you can imagine, all walking beats, solving murders, getting yelled at by their commissioner and blowing off steam at their local Thor-cop bar. "This is not about the apocalypse. It's about closing cases." Thors will depict Gods of Thunder from countless worlds coming together to uphold the peace on the newly-formed Battleworld. 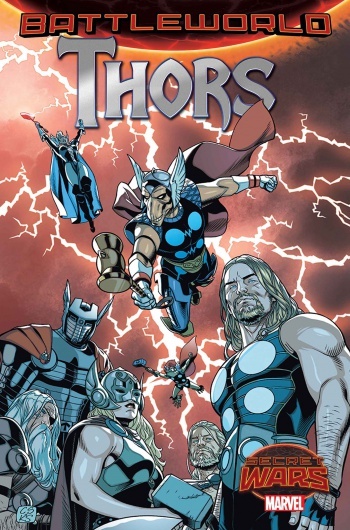 Going from the press release and Issue #1 cover, the line-up includes the canonical female Thor, Ultimate Thor, King Thor, Beta Ray Thor, Thor Stormborn, and Throg the Frog of Thunder. And I bet they're all loose cannons who don't play by the rules. What's more, the events of Thors directly tie into major cosmic happenings from the core Secret Wars book. "I'll just say that this book is probably more of a direct tie-in to the main Secret Wars series than a lot of the other tie-ins you'll see, in that the role of the Thors is something that is set-up quite extensively in Secret Wars #2." Aaron continued. "We'll be seeing a few different corners of Battleworld in this series. The Thors go where the action is." Outside of that, we only know that Issue #1 introduces a murder case that challenges the entire Thors team - and makes several members start asking the wrong questions. Beyond that we'll have to wait until June to actually read it for ourselves. Speaking personally, I'll be humming the Cops theme song the second it's in my hands. Whatcha gonna do when they throw Mjlornir at you.